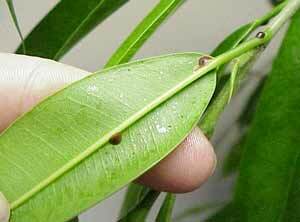 Different species of scale insects attack various kinds of fruits and ornamental plants in all parts of the country. They attach to branches, twigs, and the undersides of leaves, appearing as small bumps. Some are flattened and brown, while cottony cushion scale is thick, white, and covered with a waxy or woolly substance. Leaves on infested plants turn yellow and the overall vigor of the plant declines. Severely infested plants may die within several seasons. Mature females feed, lay eggs, and raise families under their protective shells. Eggs hatch into crawlers that feed by sucking plant juices. As they mature, crawlers produce a shell-like covering and lose their legs. There may be several generations per year. Spray horticultural oil as directed on the product label.